Charitable Gifting After the Tax Cuts & Jobs Act. As we enter the final quarter of 2018, we would like to take a moment to highlight a planning strategy that may be relevant for you following the passage of the Tax Cuts and Jobs Act of 2017 (the Tax Act). Consistent with nationwide philanthropic trends, a significant number of our clients give regularly to charitable causes. Under the new Tax Act, careful planning may help to ensure you are able to maximize the tax benefits of your charitable contributions utilizing a new strategy commonly referred to as “bunching”. State and local income and property tax deductions are now capped at $10,000. The standard deduction increased to $24,000 for joint filers and $12,000 for single filers. For those 65 or older the standard deduction is higher. Charitable donations typically represent the most discretionary deductions in terms of timing and amounts. 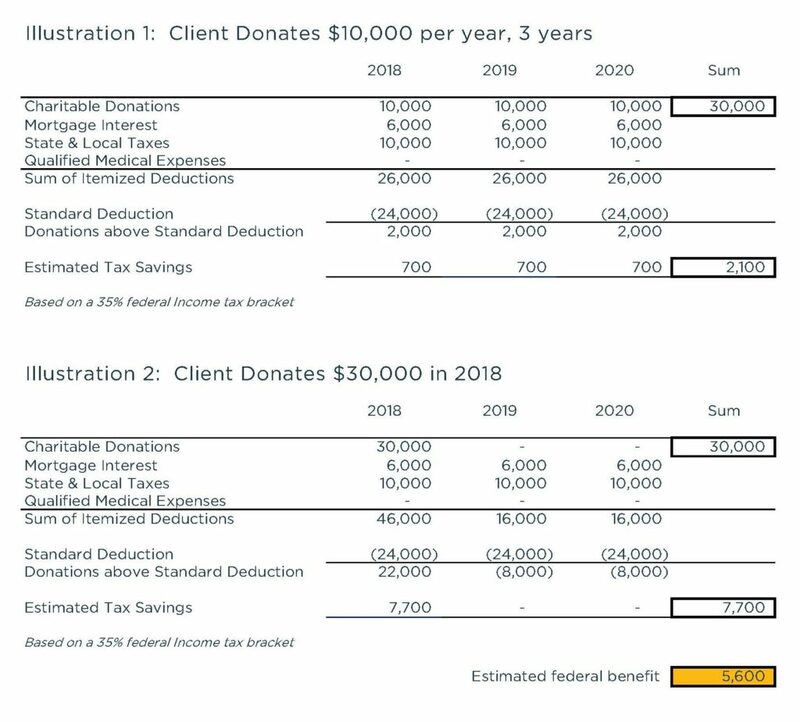 The following illustration demonstrates how timing your charitable contributions can impact your federal taxes. Assume a married couple filing jointly has $10,000 in annual charitable donations, pays $6,000 in mortgage interest and is capped at $10,000 in state and local taxes. To make the illustration simpler, let’s assume they are unable to deduct qualified medical expenses. In the first scenario, the couple makes equal annual contributions to charity. In the second scenario, the couple “bunches” their charitable contribution into one year. The result of this bunching strategy is an additional $5,600 in federal tax savings. You can maximize your income tax savings by bunching your contributions in one year, but what if you prefer to make gifts to charity annually? Through the use of donor advised funds or charitable trusts you can bunch your charitable deduction into a single year, while maintaining control over the timing of the distribution of those funds to charity. We would be pleased to discuss these strategies and other approaches to charitable gifting with you. Over the coming weeks we will be sharing more directed tax strategies. We also recommend running updated tax projections prior to year-end to determine how the many changes to the tax code may impact your 2018 income taxes. This material has been prepared for general informational purposes only and is not intended as a substitute for a formal opinion, nor is it sufficient to avoid tax related penalties. If desired, Heritage Wealth Advisors would be pleased to perform specific research and provide detailed professional advice. Such an engagement may be the subject of a separate engagement letter that would define the scope and limits of the desired consultation services.